Any wine makers in the house? I just started two 6 gallon batches of hard apple cider. It'll be ready for bottling in a few weeks and is just the ticket on a hot summer day. It's ingredients are apple juice, corn sugar (or leave that out) and some wine yeast. I have two 6 gallon glass carboys (jugs) and it should be starting to ferment when I get home from work tomorrow. After its done, I'll add a little more sugar and bottle it. It'll ferment a little more and carbonate in the bottles. A week or so after that, I'll pasteurize it and it'll be ready to enjoy. I've also made scuppernong wine from my own scuppernongs that turned out really nice. Also done a strawberry and blackberry that wasn't good, but wasn't bad either. 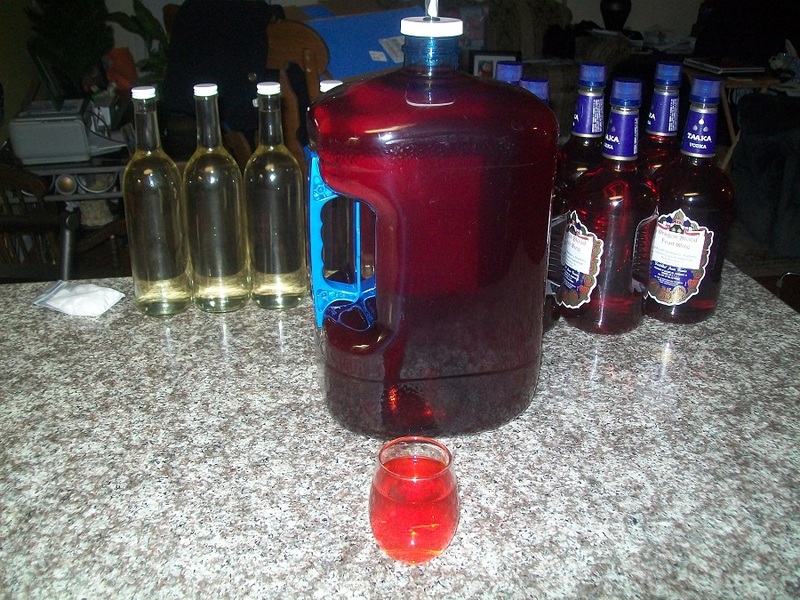 Also made one mead (honey wine) that is just awful. Re: Any wine makers in the house? Adrian I used to be heavy into wine/cider/mead/shine making. Now I only do a batch of blueberry about once a year to give out at Christmas time. Ciders are tricky gotta time the bottling just right for what you're doing to make it good. I switched to pears after that and made a nice warm honey pear wine I was never quite able to duplicate. Too bad too...that stuff was lovely. It should end up around 6-6.5% ABV. Here is what it looks like around 24 hours in.. I have dabbled in wine making over the years. I have all the equipment on hand still and occasionally consider revisiting it as I did enjoy the process. I also do home brew. I have most recently considered making Elderberry wine since this year there seems to be an abundance of Elderberries on roads. This post may be the impetus necessary to spur me in that direction. A hard apple cider is easy and delicious. Carbonating them without making bottle bombs is a little tricky, but you can do it if you read up on it a little. I haven't made any since 2015, but have this batch going now. Looking forward to trying it in a few weeks. I am a small batch brewer: beer, wine, mead and cider. Currently have 1 gallon of cab with some oak in it fermenting away as well as 2 gallons of black IPA ( http://www.saltcitybrewsupply.com/scbs-black-ipa-recipe-kit.html ). Just bottled a hard cider that I "flavored" with some whiskey soaked in oak, also made it sparkling. I like to experiment with different things, some turn out good, some not. I have gone to some forums but most of them are so far over my head that I can't really get much out of it. Most of my brewing in limited to weekends when I can find a few hours to brew. As for beer, I have a two gallon water cooler converted to a mash tun ( https://www.homebrewstuff.com/2-gallon-mash-tun.html ) and another 2 gallon cooler converted to a hot liquor tank. This allows me to brew two gallon batches as long as the grain bill isn't over 6 pounds. I fly sparge from the HLT to the mash tun. adrianrog I will definitely try out that yeast for my next cider. I don't have my notes with me but I believe I used Mangrove Jack's cider yeast for the last batch. Looking forward to more discussion here. PS Have one bottle left of a hard, sparkling cyser that I made which turned out well. The fermentation gave me trouble but it turned great. Heading to the smokeys next month and plan on bringing it to sip on. Cheers! Started a wine yesterday. The "juice" is a grape juice but not made from Concord grapes instead made with Syrah (shiraz) grapes and some cranberry. It looks and smells delicious. Should make a nice light wine. Mine is about done. I washed a bunch of bottles yesterday, going to back sweeten and then carbonate it in the bottle. It'll probably only take a few days to carbonate and then I'l pasturize it. Should be good. Popped open the Black IPA and whiskey oaked cider mentioned above. Both turned out good especially the cider. Brewed a porter to which I will add vanilla beans soaked in whiskey. Porter was always just about my favorite of the darks....oh how I miss it. I just saw this thread!! I starting making wine this year and I blame it on my Aunt since she made a comment about persimmon wine her uncle made when he was still with us. I decided I'd surprise her and jumped in with both feet. Here's a few pics from earlier this year. It's hard to believe how clear the persimmon wine is. I've been making wine for a couple of years. It's practically all I drink now. I have just a couple of bottles left of a cranberry batch that I made for the holidays. This year was the first year I ever made cherry bounce. Picked all the cherries off of wild trees on our property. It turned out really good. I made a few gallons of elderberry syrup too. I am about ready to start a batch of beet lacto-ferment this week. 1. May have to dry that Dragon's Blood! Looks very tasty. 2. Currently have a cider and beer fermenting together, something Graf-like. Just dry hopped with Nelson Sauvin hops and I plan on carbonating when done. I'd be happy to post the recipe if anyone is interested. 3. I have been having difficulty getting my FG down to the proper range. Began adding oxygen with a small pump to help create a better environment for fermentation. I use dry yeast and I have been reading how dehydrating the yeast can also help develop a stronger fermentation. Does anyone have any experience with doing this and is it effective? I'll hang up and listen.